So I know How to treat hypothermia. That question and answer, however, do not address the old recommendation I have heard a 100 times of strip them down and get in a sleeping bag with them. Is that preferable, or is it better to just wrap them up alone? Assuming all their clothes are wet. You could do a lot worse than strip them and get in a sleeping bag with them, and indeed this used to be instructed as standard first aid for hypothermia. However, as far as I'm aware this has now changed and the recommended approach is to construct a 1 person thermal burrito / hyper-wrap. I would add that as well as hot water bottles, reusable thermal heat pads can also be used - the more warm things (but obviously not scalding hot) you can find to provide heat to the body, the better. I would like to add to berry120's answer with my own. I thought of suggesting this as an edit but thought adding an answer was more appropriate. What he said is correct, however I think it is important to mention a few things. If you are treating someone in this fashion, they most likely have severe hypothermia where they are no longer shivering and are not very responsive, if at all. Great care must be taken in moving them if necessary. This person needs to be evacuated to medical care if possible, so depending on your situation, call EMS or send a party to get help if this is feasible. In a wilderness scenario you also need to be taking care of yourself so making camp and getting a fire going and maintained is also critical. Don't neglect the patient, but if you don't take care of yourself, you can't help them either. Hypothermia is a process, so treatment differs depending on which stage they are in. You wouldn't usually treat first stage hypothermia with a hypo-wrap. Basically by the time this person is in need of a hypo-wrap, it's going to be very difficult to get their body warm. They can't generate enough heat to warm themselves anymore, whereas in earlier stages the patient is still capable of generating heat through various methods: mild exercise and drinking and eating high-carb substances. However, you do not give food or drink to a person with severe hypothermia. 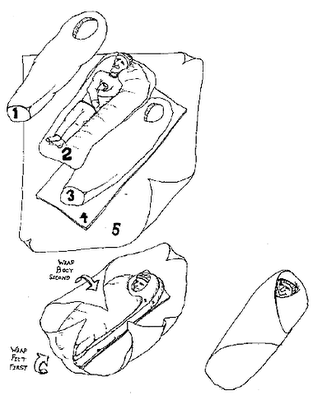 Putting a person in a sleeping bag with the hypothermic person is not an effective way to warm the patient. This extra person can do other useful things to help with patient care, such as heating water for the bottles, monitoring vitals, tending the fire, preparing food so you don't have to, giving you a break, etc. This article from Wilderness Medicine Institue is very informative on this topic. Assuming the patient's clothing is wet, and you will need to remove it, especially if you're constructing the hypo-wrap with anything involving down, which doesn't insulate when wet. Put the patient in dry clothing if possible. Again this needs to be very gentle due to the severe hypothermic state. When you make the hypo-wrap, use items from the patient's gear first. The steps and diagram for making the wrap listed by berry120 are accurate, but add a last step to the instructions: use rope, cord, straps, or clothing to tie the layers together so that it keeps it as a unit and not falling apart. Make it just tight enough to hold it together but maintain the loft of all that insulating material. Ideally have the hypo-wrapped patient inside of a tent and have one or two people in there with them. The extra insulation from being in the tent will help prevent heat loss and potentially help heat the patient without sacrificing the body heat of the 'warm' people. These people can also monitor the patient and check vitals. And before you do anything at all make sure the scene is safe! This is by no means a complete instruction on caring for a hypothermic individual. These are just some important points when a hypo-wrap is involved. Also no two scenarios are identical and different situations will require some variations in approach. That's where training comes in to help make wise decisions. This information comes from over 13 years experience in the wilderness and certification by NOLS in WFA in addition to other training. (I plan on getting a higher cert.) If you venture into the wilderness on a regular basis, I highly, highly recommend getting some type of wilderness medicine training for at least one member of your group, preferably more. It's worth the expense. NOLS Wilderness Medicine Institute provides great training at different levels from WFA to WEMT, and American Red Cross now offers a Wilderness medicine class as well. Not the answer you're looking for? Browse other questions tagged first-aid cold-weather hypothermia or ask your own question. What is a Burrito wrap?